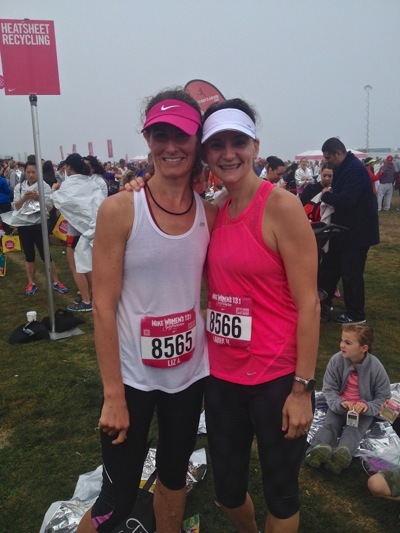 Just in: photos of Menlo Park moms who completed the Nike Women’s Half Marathon earlier today in San Francisco. They were among 25,000 participants. The overall winner was Victoria Mitchell of Waverley in a time of 1:19:49, of note as there are men in the race. 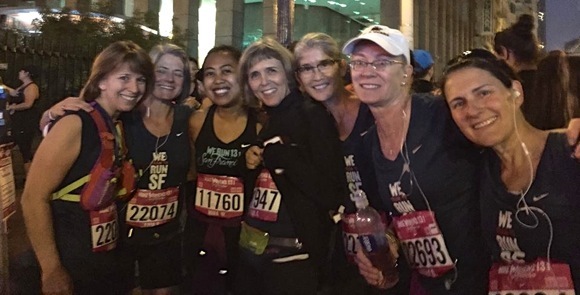 Pictured top right is InMenlo contributing photographer Irene Searles and Kathy Oppenheimer at race end. At middle right right is Liz Ashe and InMenlo contributing photographer Laura Hamilton. Bottom: Some members of the Fleet Feet Menlo Park training group before the race started.